Although she hasn’t been seen inside a cage for almost a year, female MMA superstar Gina Carano has never left our dreams, ahem, thoughts. 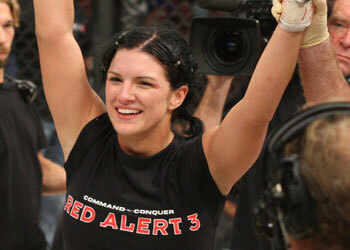 Carano is set to put an end to her hiatus, as well as questions concerning who is the world’s best female mixed martial artist. In addition, as previously reported here on 5thRound.com, the winner of this catfight will be anointed the first-ever women’s MMA champion. That’s right, so not only will fans finally get to see these two go at it, but it will be in a 5Round affair. “Strikeforce: Carano vs. Cyborg” will be jumping off inside the HP Pavilion in San Jose, California, with tickets having gone on sale June 15th.